If you’ve abused substances long enough, you’ve noticed the physical changes in your body--from lack of energy and focus to chronic inflammation, heart disease, persistent bacterial infections, muscle deterioration and degenerative bone disease. It’s time to reinvigorate your body and get it back on a healthy track. These simple juice and smoothie recipes are designed to reintroduce important vitamins and minerals your body needs to recover after the years of damage caused by substance abuse. These simple recipes are designed to reintroduce important vitamins and minerals your body needs to recover after the years of damage caused by substance abuse. Try them, then venture off on your own, and experiment with flavor combinations to create new favorites. A good source of fiber, vitamin C, vitamin A, gingerol and potassium, this juice will give you the nutrients you need to produce bone-strengthening collagen, to eliminate toxic wastes and ward off infection and chronic illnesses. The bioactive substances found in just 2 grams of ginger per day have been shown to lower one’s risk of infections, muscle and joint pain, headaches and nausea associated with withdrawal. It can reduce ApoB/ApoA-l ratios by 28%, markers for oxidized lipoproteins by 23%, and it may even help control the growth of abnormal cells that lead to cancer. In just 30 days of drinking this juice, you can increase several markers of antioxidant activity. When coupled with cucumber, the antioxidants can help regulate your body temperature and inhibit harmful free-radicals. This orange juice may not contain oranges, but it does contain a rich amount of potassium, iron, vitamin A, vitamin B-6 and vitamin C. When you’re in recovery and are fighting to stay clean, you need to remain alert and focused. This drink can help, with around 17% of your daily recommended iron, a mineral important for energy levels and circulation. This juice also contains a copious amount of vitamin B-6, which supports a healthy metabolism. The juice is also high in vitamin A, an antioxidant important for your vision, reproductive and organ system health. 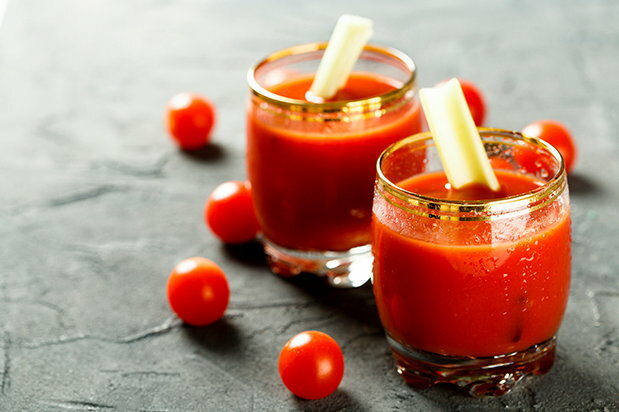 Wake up your mornings or afternoons with this spicy drink. It contains B vitamins(B-1, B-3 and B-6) important for metabolism and minerals like iron, phosphorus and manganese. This juice also has almost half your day's worth of potassium, an electrolyte needed to maintain energy and muscle function. 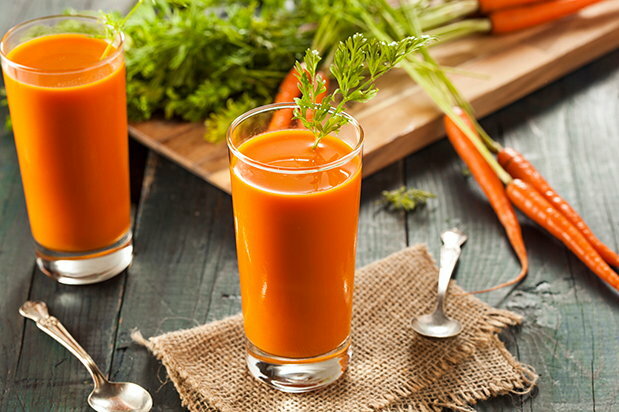 Try this juice at breakfast or midday when you feel that afternoon slump coming on. The vitamin E in spinach, pineapple and banana may help improve blood flow by widening blood vessels that have become constricted by substance abuse. 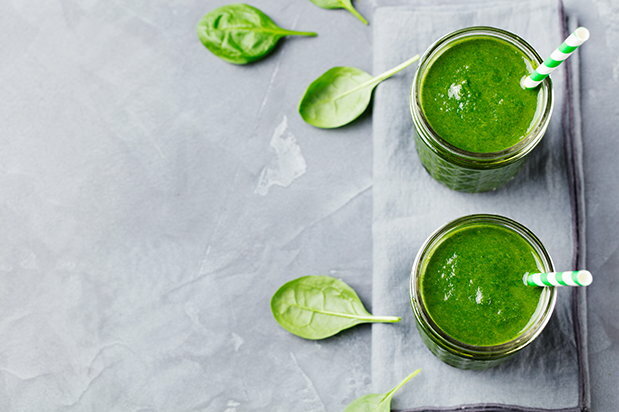 Loaded with antioxidants, you’ll also protect your cells from damage that causes premature aging, and the almond milk found in this smoothie provides heart-healthy fats. 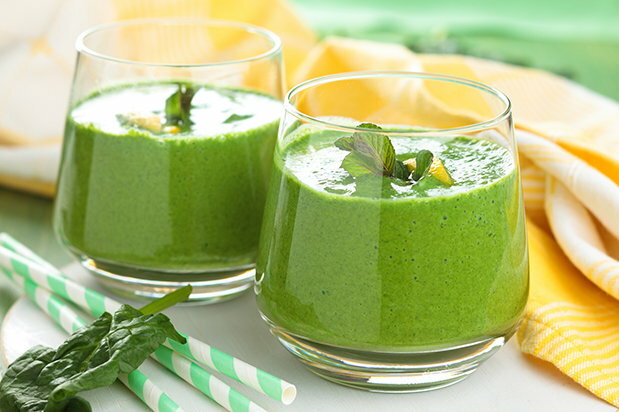 This smoothie is also very high in manganese, a mineral that supports a healthy metabolism. Don't be fooled by the pretty color of this smoothie. It's antioxidant-packed to boost your immune system and prevent certain cancers. It’s all thanks to the tannins found in pomegranate and berries. Chia seeds, with their nutty flavor, are added for protein, iron, fiber, calcium and essential omega-3 fatty acids. 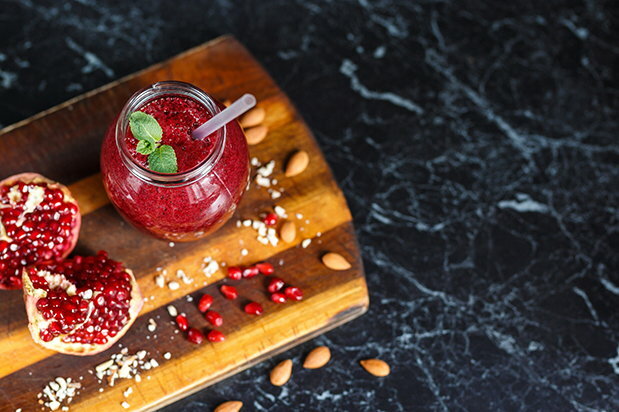 All together, this smoothie will help build essential muscle, fortify bone, eliminate toxic waste, increase your white blood cell count and guard your heart. These five healthy juices and smoothies are just the start you need to regain optimal health. As you dive in, we hope you’ll find a passion for juicing and explore other juice recipes that get you back in tip-top shape.